E-ink-Reader. The second life of the smartphone.. Attention: authors aren't responsible for malfunctions of your devices, which can be got as a result of using this information. Everything you do is for your fear and risk. Using of such method removes your smartphone from warranty service! Such malfunction of smartphones happens very often: everything works, except functional bottom keys. So, you can exit from any app only by rebooting your phone. Using of such device is impossible and ordering the new touchscreen is very long or just impossible. Nowadays some spare parts for different models of smartphones can't be found easily. 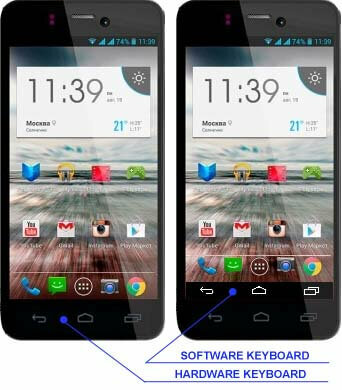 But this problem can be solved without opening the case of the device by turning on of the Android operating system software support function keys. In this case at the bottom of the screen appears area with a duplicate of the old function keys. This opportunity was provided for the correct operation of the models of tablets and smartphones which do not have the hardware function keys. To activate this function it's enough to insert the line "qemu.hw.mainkeys=0" at the very end of the file /system/build.prop, but the file can be edited only by a superuser. For installing you need Root-rights, and also several subsidiary programs and multiple device rebooting. Beforehand, we download programmes Total Commander for Android, Root Explorer (File Manager) and utility for getting Root-rights (in our example - Framaroot 1.9.3, a concrete program depends on product model) from the site 4pda.ru. Pull out USB-cable and open menu "Settings", put the tick in apps "Unknown source" and, as we can't return from settings, reboot the phone. Open regular file manager, go to /sdcard/download ("Downloads"), run Total Commander. In Total commander go to /sdcard/download ("Downloads"), open Frameroot 1.5.3.apk , there choose the type of superuser "SuperSU", and the programme asks to reboot the phone. After reboot you can launch either Total Commander, or file manager, after that, go to /sdcard/download ("Downloads"), and launch Root Explorer. In this programm choose in the start of file system folder /system, searching file build.prop and marking it, allowing to record and read this file. Reboot smartphone, launch Total Commander, go to /system and edit file build.prop, adding words "qemu.hw.mainkeys=0" in the end of file, save the changes, by pressing "Floppy disk" icon, reboot again. As a result we get extra functional keyboard above the malfunctioned and admire the work with your phone. The last two steps can be changed by downloading of the app Soft Buttons from Google market, which will do the same things automatically.